If you have ever moved, chances are your moving experience did not go as well as the family from happy stock-photo land. Moving conjures up images of chaos, stress, and fatigue. Fortunately, preparation is your best ally in conquering the stress associated with moving. Here are a few tips for making your moving to Dallas experience less stressful. Clothing-A general rule of thumb is if you haven’t worn it in a year, you aren’t going to, so give it to someone that could use it. Donate it to a charity such as Goodwill, or sell it to a consignment store like Plato’s Closet for a few bucks. Old documents-We all know you are proud of your child, but do you really need to keep all 2,952,173 pieces of homework you have kept from Kindergarden to High School? Keep the important stuff and recycle the rest. Miscellaneous Items-Go through your linen closets, kitchen, and bathrooms and set aside mismatched dishes, extra linens, and utensils you have multiples of. You will often find you have more of these items than you thought you had. One of the most frustrating things about moving is when you finally get to your new home, you don’t know which box anything is in. Use moving labels while packing to let you know which room each box of stuff is for. The Container Store makes a set of color-coded labels that identify which room the box is for. 3. Make sure you hire a reputable moving company. When you move, you are putting your possessions in the care of someone you have never met. Moving scams are common, so it is important to do your research and choose a reputable company. 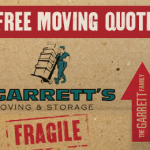 Garrett’s Moving and Storage has been helping families and businesses in moving to Dallas since 1992. We are the only moving company in the area that has maintained an A+ Better Business Bureau rating for the past 20 years. With Garrett’s Moving and Storage you can have peace of mind in knowing your possessions are in good hands. Keep checking our blog for more tips and tricks on how to make your moving experience the best it can be. This entry was posted in Stress Free Moving Tips and tagged Dallas Moving Companies, Moving Tips, Moving to Dallas. Bookmark the permalink.